The summer after her beloved husband died in a car accident, Julia Meriwether Crane is still picking up the pieces of her life in Mirabelle Harbor and trying to help her ten-year-old daughter adjust to this difficult new reality. After her best friend Sharlene—one of the well-known Michaelsen siblings—talks her into finally going out on the town again, Julia finds herself stunned to be the object of interest of several different men: The boy who’d broken her heart back in high school. The college ex she’d left behind. And most surprising of all, the movie actor she’d always fantasized about but had never met in person until now. Can one woman have more than one “great love” in the same lifetime? And, if so, how can she be sure which man that’ll be? Sometimes the person you think will be best for you…isn’t the one you really want. THE ONE THAT I WANT, a Mirabelle Harbor story. Book 1 in the Mirabelle Harbor series, a standalone romantic novella called TAKE A CHANCE ON ME, is also out now and it's for sale *everywhere* for just 99-cents in celebration of the release of THE ONE THAT I WANT. Dedicated personal trainer Chance Michaelsen falls hard for Nia Pappayiannis—his complete opposite and a member of the family that owns the Greek bakery just down the street from his gym. He considers their pastries to be the enemy of good health, but his attraction to Nia can’t be denied. In matters of the heart, would you risk it all? TAKE A CHANCE ON ME, a Mirabelle Harbor story. Cover comment: This cover seems so 'New Adult' to me with the romantic couple on it but this novel is women's fiction. 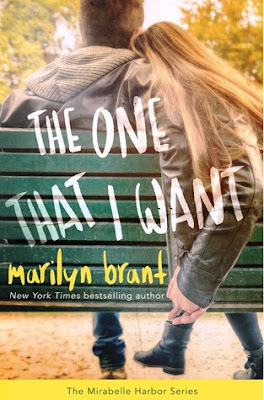 The One That I Want is an engrossing story of moving on, finding love and developing trust. Author Marilyn Brant paints a picture of a contemporary love story featuring an independent woman and the three men from her past who suddenly crowd her present. Julia, 36, is the main character and she's very likable. A widow, she is now raising her ten year old daughter and feeling the pressure of her closest friend Shar's insistence that she try to socialize. Getting out means meeting a social group and during one of their outings, Julia goes to see a play featuring her childhood crush, actor Dane Tyler. Their first meeting doesn't go well but Julia winds up running into an old high school beau and her college boyfriend at different events. Trusting her intuition, her maturity and life experiences, Julia bases her actions with these three men on the present, as opposed to those who seem mired down in reliving their glory days. I thought the characters were very well developed and Julia's voice, while being sympathetic, came across as strong and resilient, with a touch of sadness. What could have been an utterly sad tale turns into something filled with life affirming opportunities, new friendships, and another chance at love. I particularly liked her relationship with her daughter, with Shar and the one man she chose to spend time with. I thoroughly enjoyed my stay in Mirabelle Harbor. Now I have this need to eat brownies. There is a tour-wide giveaway (INTL) and it ends on August 13th. 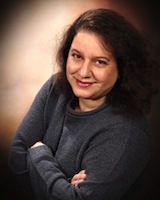 I loved your thoughts on the novel and truly appreciated the time you took to read and review my story. So glad you enjoyed it!! This sounds like a great read & series. I have to say, I have not read many WF novels, and this sounds interesting, and the cover does give it the NA feel, but it is a nice cover all the same.